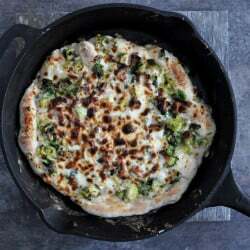 I just tried making this, and wound up burning the hell out of the bottom of the crust and having it be still completely doughy in the middle/top. Just wondering if you put anything in the bottom of the pan in case you need to let a thick crust stay in a little longer? 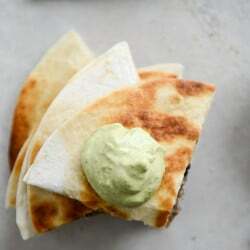 Or if you have any recommendations to not burn it next time, because it looks sooooooo good in your photo. This looks so yummy! I’m going to try it this week for sure. One question though, how does the pizza dough keep? If I make the dough in the amount you did but only make one pizza will the remaining dough be okay to put in the fridge or should I use it immediately? Just wanted to suggest putting the pizza on an upside down cast iron skillet. This way, the raw pizza slides on easier, and the cooked pizza just slides off without having to use a spatula. I cracked a couple of eggs over this sucker and turned it into a breakfast pizza! Amazing! That’s all I can say. I’ve definitely gotta try this method, totally new to me, but anytime I can use my cast iron skillet I’m all for it. 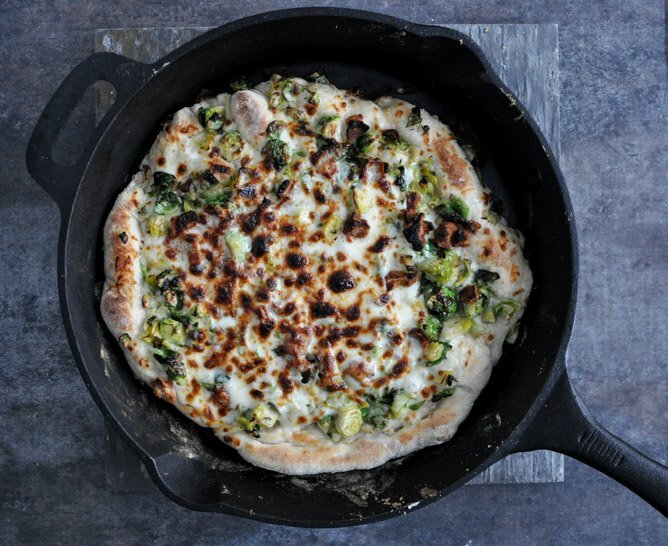 i was trying to prove that brussel sprouts are a legitimate pizza topper and your recipe validated this. Thanks! Alex. Finally tried this method tonight! Turned out great, except the crust wasn’t as done as I would have liked. Was still a little doughy…..any suggestions? So excited for this! I wonder how blue cheese would be? Wow, I never thought about that combo of toppings. And, the cheese trio seems super tasty also. I guess this proves you can put just about any proven flavor profile on a pizza and it will turn out great. You are a brussels sprout queen! i cannot wait to eat an entire pizza to myself. Thank you, thank you. Yeah…. no, it doesn’t. I used a regular size plastic cutting board, floured. Pizza turned out amazing. Warning: I’m putting this on my blog! I’m looking forward to trying this. Does the cast iron pan need to be seasoned? Why do you pictures show parchment paper? Did you line the skillet with it before adding the dough? nope – just for photography purposes and so i can somewhat preserve the tiles underneath it from the cheese and flour residue from the skillet. This was the first cast iron pizza I made and it was absolutely delicious. I haven’t been able to eat pizza out again because nothing beats pizza on my skillet! Thanks!